Thai cuisine offers some of the most complex and delicious flavors to be found in the world of food. Often, however, with its myriad of seemingly exotic ingredients and methods, it is impossible to replicate in your kitchen. But take heart! New Thai Cuisine shows you how the wonderful tastes of Thailand can be prepared in your own home. Chef Nathan Hyam has studied Thai cuisine for over a decade and has mastered the art of Thai cooking for Western kitchens. 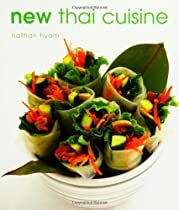 With practical tips on how to substitute ingredients to adjust to your palate and how to master Thai cooking techniques, you’ll soon find yourself on an exotic journey of the tastebuds.